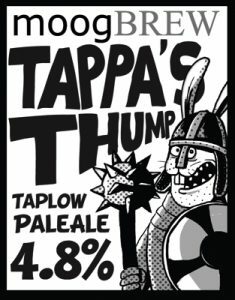 Tappa was a 7th Century Rabbit King who was buried in a very large mound in Taplow together with a big horn and a massive weapon. His horn could have been used to drink this very fine American style pale ale featuring golden coloured malts topped off with juicy, fruity US hoppiness. His mace could have been used to brain anyone who tried to steal any beer. Hence being ‘Thumped by Tappa’.